Ahh, the white dress shirt. Ubiquitous. Misunderstood. Misused. My first order of custom shirts included 2 different white fabric weaves. I guess I just kind of assumed white was a staple dress shirt. Well, it is I guess, but I’ve found that blue shirts are almost always a better choice – especially in the context of how I dress now, which is mostly odd jacket and trouser combinations. Generally speaking, I’ve learned that a white dress shirt is more at home with a suit. So I received these shirts, and I find that they get about half the wear of my blue or patterned blue and white dress shirts. Early on in my menswear journey, I wore white dress shirts all the time. Then as I learned more, I realized that white was more often than not a sub-optimal choice. Reading threads on StyleForum about the inherent formality of a white dress shirt, and internalizing some of the viewpoints of hallowed members, I almost stopped wearing them entirely. Occasionally I would wear one in a sober business outfit, but that was it. In my #menswear post I graphed out my confidence as I learned more about the different aspects of men’s clothing and how it all comes together in an outfit. There’s a similar curve related to the oft-quoted “rules”. First, you don’t know any better. Next, you follow the “rules” without deviation. Finally, you arrive at a comfortable level of confidence with your dress, and know that the concept of “rules” is silly and contrived but also that these rules can be a good guideline to follow. Deviation is fine because now you have awareness of the deviation, and can review and justify it (at least to yourself), and move on with your day. So, I’m going to move on with my post and talk about how I approach wearing a white dress shirt. This can absolutely work. This can absolutely not. It’s a matter of formality, but also subjectivity to be honest. Navy sport coat, grey trousers? Great. Brown jacket and jeans? Fine. Would either of these examples benefit from a blue shirt? Definitely. There have been a few times I’ve successfully (?) used a white dress shirt in an odd jacket and trouser combination. In this outfit, I chose a white dress shirt for some extra contrast. 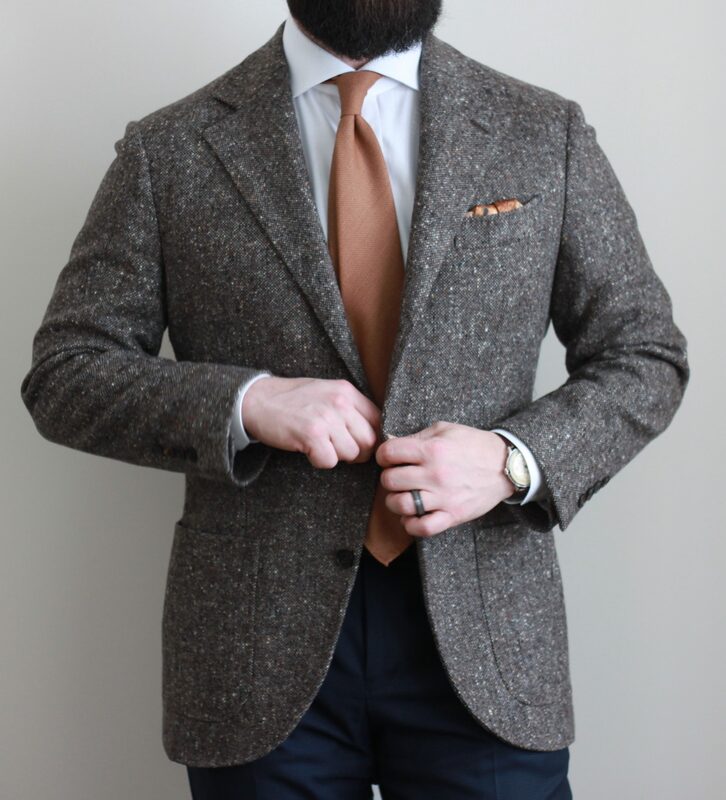 A white shirt would be fine with this tweed jacket and dark denim, so why not with navy trousers? 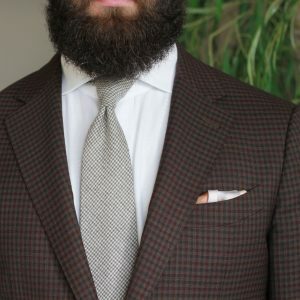 The tie is my granola coloured hopsack from Vanda, since it wouldn’t be too stark against the white shirt and the colour would pick up some of the flecks in the Donegal weave of the jacket. 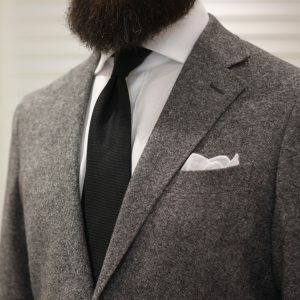 I felt that the colour and texture of the tie wasn’t too formal for the rest of the outfit. I think a light blue shirt would have been just as good in this instance, especially against the navy trousers. In the end, I think the overall look pulled together everything pretty well. With this jacket, I usually try to keep things simple. The white dress shirt here definitely makes the colour of the jacket extra vibrant. 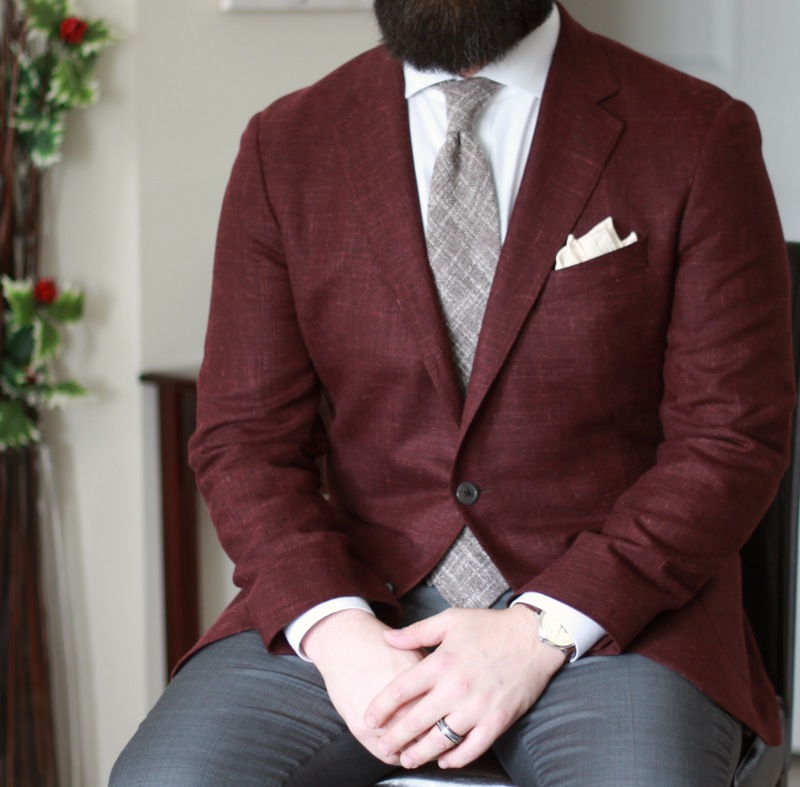 Adding to that is the gorgeous texture and striations that the linen blend provides (read more about the jacket here) This contrast is toned down a bit with the Vanda accessories I selected: a brown and white linen cotton blend tie and a cream textured pocket square. My choice of mid grey trousers provides balance to the upper block, and grounds the fit overall. In this case, I don’t think a blue dress shirt would have been better. This is a bit of a “rule” for me: I don’t like to pair a plain white pocket square with a plain white shirt. If my pocket square will be white, I prefer the shirt to be blue, or a blue and white pattern. Maybe in a truly conservative outfit where only a sliver of the folded pocket square will be visible could I see it with a white shirt, but usually in that case I’d be in a light blue shirt anyways. That logic flow is backwards from how I usually put together an outfit though. With a white dress shirt, I often reach for my cream coloured pocket square. Failing that, I’ll avoid a neutral and go with something colourful that relates to the rest of the outfit. In the above image, you may notice me pairing a white shirt with a white square *gasp*. I know, you’re thinking, “this guy just said he doesn’t do that! ?” Well whatever. I put quotes around the word “rule” to signify the looseness of my application of its meaning. Also I wanted to add a couple more pictures so my posts stop looking like essays, and these happened to be white shirt, odd jacket combos. Do you have “rules” about wearing a white dress shirt?